My favorite song at the moment is that of the white throated sparrow. It’s a simple little song consisting of four tones; apparently the second is a whole note lower than the first, and it ends a minor third below that. It sounds to some people as though the bird is saying “Po-or Jack Peabody Peabody Peabody.” And that is our clumsy, human way of describing this wild wistful little song. I asked Malcolm what it sounded like, and he said, “Sad but hopeful.” And that’s exactly how it sounds to me, too! It’s nostalgic and full of memories, but it sounds like spring and good thoughts for the future. I love the fact that birds have dialects and regional accents. Your knowledge of a white throated sparrow’s song will be different from mine if you live in a distant part of the country. I feel so lucky to have this particular song be my white throated sparrow-neighbor’s song. And a sparrow is such an ordinary little bird. If you saw sparrows in your garden you’d say, “Oh it’s just a bunch of sparrows,” and not even take the trouble to find out what kind of sparrow they are. They’re small and plump and drab and brown. But the white throated sparrow has dashing yellow spots on his head, and when he opens his mouth…glory! I love the fact that we can try to define the song according to our understanding, and describe the intervals between pitches and the rhythms of the notes, but in reality, the song contains subtleties beyond our human musical language. We can never pin down the specifics of melody or meter, just as we can never know what the bird is saying when he repeats his song over and over. And that mystery makes it even more beautiful. So this is the song stuck in my head, that I whistle over and over as I go through my day. This is my favorite song at the moment. This week’s interactive playlist will be all of our favorite songs at this moment in time. I obviously need your help with this one, or it will just be a short list of songs that I like. Funnily enough, all of the songs I added to the list sound wistful to me. Must be springtime! I haven’t been listening to anything new lately. I’ve been playing some songs for the boys that I used to love, and I’ve had a few longtime favorites buzzing around in my head for one reason or another. What about you? What have you been listening to? Add your songs to the playlist, or leave a comment and I’ll add them myself. This vegan sauce was very smooth and flavorful. I utilized two of my favorite creamy-vegan-sauce making tricks…cauliflower and almonds. They’re both quite mild flavors, but they blend up nicely. 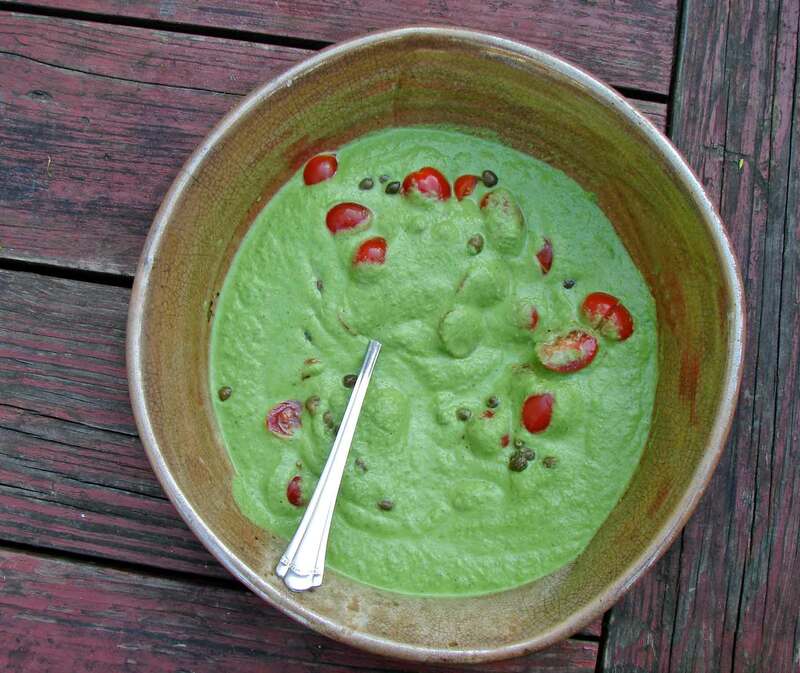 This sauce, as you can see, is lovely and GREEN!! It’s a good sauce for spring. I added grape tomatoes and capers, for a little juicy tangy kick, but you could use it as it is, or add any kind of vegetable or bean you like. White beans or chickpeas would be nice. We ate it over orchiette pasta. If you add less water, you’d have a nice purée as a side dish or base for a more substantial main meal. If you added more water or vegetable broth, you’d have a smooth velvety soup…a bisque.